Pleasant. If I had to sum up Ori and the Blind Forest in one word, that would be it. The new Xbox One and PC platformer looks like a magnificently drawn kids' fantasy book sprung to life. It has the lush, magical aesthetic and inoffensive charm that gamers have come to accept—and expect—from indie games. Thankfully, unlike other similarly charming indie titles that have stuck pretty artwork on top of an established genre template, Ori and the Blind Forest doesn't take "pleasant" to mean "toothless." While the game takes a great deal of pride in its inspired visuals and its bittersweet coming of age story, it doesn't do so at the expense of its gameplay qualities. Ori can be a resolutely solid, tough-as-nails platformer when it wants to be. So while the game might end up feeling light-weight in comparison to other, meatier titles that have graced the Xbox One, it will nevertheless leave you satisfied with the knowledge that you've had to put in your time to see the story through the end. It just might only take you 8-10 hours (or, in my case, 12-15) to do that. All that whimsically adorable stuff happens in the preamble to the game, though, so when you sit down to start playing Ori and the Blind Forest, prepare yourself for some Bambi-level tragedies before you really get down to playing. Once all the bad stuff happens and renders the forest withered and almost lifeless (hence the "blind" part of the title), Ori is left to explore on his own. Well, almost on his own. Soon after he's orphaned once again, Ori meets a sprite named Sein who floats around above him, helping Ori by attacking bad guys at your command and doing other magical stuff like opening special passageways. A small child, torn from his parents (twice!) and cast into a dark and foreboding place in which he must learn to fend for himself...with the help of a cutesy sidekick. It's a story we all know very well at this point. Ori and the Blind Forest doesn't bother trying to break the mold. But the game's platforming mechanics are solid enough that they end up complementing Ori's saga in a satisfying way. See, Ori starts out his adventure like many video game characters do: inexperienced. All he's really able to do is run around and jump between different things. Once he meets Sein, he learns how to attack as well. This means he can start to fight back against all the gross monsters taking over the forest. Over time, Ori and Sein build upon and expand their abilities by working together. But pretty much all of their improvements feed into the original three core actions: running, jumping, and attacking. This makes any new ability you unlock easy to fold into your existing skill-set. Over the course of a few hours, then, it really feels like Ori has come into his own as he continues to fight for all the good stuff that's worth saving in the forest. As with its story, Ori's gameplay sits firmly within its genre as two-dimensional platformer—albeit an unusually pretty one. You spend the majority of the game doing things that will come easily to anyone familiar with other side-scrolling platformers: running around the forest, hopping between shaky stone platforms with dangerous thorns underneath or shimmying up the trunks of trees to make your way to hard-to-reach areas all while "shooting" at spiky enemies by way of your spirit friend. Each stage of the game unfolds predictably: you enter into a large, mostly unexplored area of the forest, and gradually make your way to objectives scattered around that particular part of the map. Boss fights and climatic events are similarly routine, challenging you to jump in a certain order to escape a monster's attacks before chipping away at his health in small intervals, or escape one part of the map before it floods with toxic Ori-killing goop. "Routine" doesn't have to be a bad thing, mind you. Ori might be lacking in originality, but it compensates for this weakness by making what it does offer competently satisfying. Its controls are particularly nice. Platformers like this live and die by the accuracy of their inputs, and Ori and the Blind Forest fits perfectly with the Xbox One's controller in this regard. I had plenty of moments where I cursed at the TV screen and fought the urge to hurl my controller across the room because I'd lost my footing and caused Ori to die and return to his last checkpoint. Cleverly, the game actually lets you set your own checkpoints by using a portion of Ori's energy reserved for some of his special abilities. I never felt like these frustrating episodes were anything other than my fault—especially when I was dropped back to a spot of my own choosing. Unfortunately, there were also a few times when I was totally justified in wanting to chuck my Xbox One out the window because something went wrong that was not my fault. Three or four times, the game simply wouldn't display properly whenever I tried to open it again from my Xbox One dashboard after switching over to something else—showing static or simply an all-white or all-black screen that would intermittently switch over to the game. The only thing that resolved this was uninstalling and reinstalling the game on my Xbox One. Other than that, the game worked very well. Which is a relief, because it can get pretty tricky. The challenge of Ori—like any good platformer—is making it from one end of the map to the other with a small handful of increasingly complicated tools you have at your disposal. Early in the game, for instance, Ori acquires an ability to "wall-jump," which allows him to effectively shimmy up any vertical surface. Since this comes shortly after Sein adds a spirit-shooting ability to his arsenal as well, pretty soon you're required to solve environmental puzzles by scaling a precarious surface while shooting at nasty-looking pink blobs who split into smaller blobs that keep attacking you once they've been hit. A less competent developer would have made this simple piece of multi-tasking incredibly frustrating. But in Ori and the Blind Forest, it really feels like you're deftly performing some daring wall-climb while simultaneously fending off blob monsters. A similar thing happened two or three hours later when I learned a nifty vaulting move that keeps Ori airborne while slinging him in different directions. I stumbled at first, dying many, many times. Finally after several dozen tries, I was zipping through the air with (relative) ease. That's the rhythm of Ori and the Blind Forest: confusion, followed by frustration, followed by something akin to mastery. If you ever get too confident in your newfound physics-defying abilities, though, there are always secrets and hidden passageways lingering around the edges of each map—taunting you to try and see if you can make it over that last patch of spiky floors and ceilings. 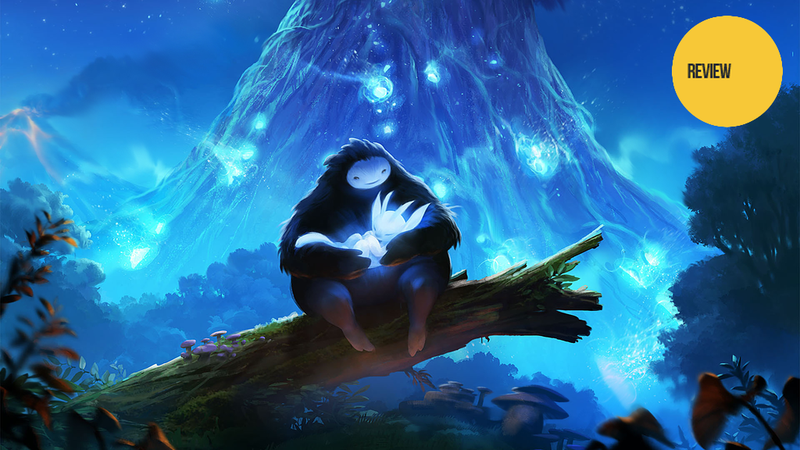 If I have a bone to pick with Ori and the Blind Forest, it's that the game doesn't really push itself. I mean, sure: it plays very well, it looks great, and sounds even better thanks to its majestic orchestral score. But I have a hard time thinking of anything about the game that feels particularly daring or unique. I want to see expert developers like the ones at Moon Studios work outside their comfort zone. Even the highest of Ori's high notes—the enchanting beauty of its scenery, score, and story—all feel as if they're trying to play it safe, lest the game edge too far out of the "looks sort of like a Miyazaki movie" rulebook. And while the platforming is certainly solid, it doesn't bring the same level of wonky creativity to the table as, say, Rayman Legends did back in 2013. Ori and the Blind Forest isn't amazing. It's not bad, either. Again, it's just...pleasant. It's an endearing diversion of a video game that's very difficult to say anything negative about. Does that mean you should play it? Sure, by all means. Use it, like I did, as a palate cleanser between the other, bigger games that demand more of your time and energy. Or play it for a few hours of good solid fun in its own right. Just don't expect it to change your life along the way.